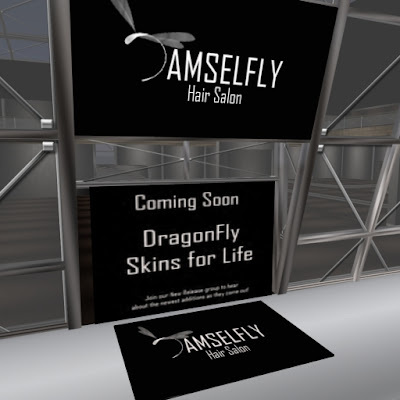 So by now, you've probably all heard that Damselfly has opened a sim in InWorldz. And yes, I'm still holding out for Truth hair to make their appearance. But for now, hooray, new hair! I know... why am I blogging about a hair place when I'm going to be making hair? Simple... it's what I do, blog about new stuff, fashions, styles and hair in InWorldz. That and it's so hard to resist new hair. Just helping out my fellow hair-flys. You know you can't resist, either. Just sayin. There has been a steady stream of customers every time I've gone to Damselfly for a visit. Here we see Gia Capalini and one of her fellow models from Allure Modeling agency, browsing the goods and filling up their shopping bags. I've selected two styles to share with you; Lexandra and Lavynder. Both are wavy styles, though the Lexandra is a longer, fuller style, and the Lavynder is a great wavy shoulder length style. I purchased the "Mixed" color packs so I have six colors to enjoy from all the major color packs. Have to admit though, I'm still not thrilled with the red shades from Damselfly. But being a natural red-head I'm a bit picky. Still, there are some lovely styles from a talented creator who has been making hair on the SL grid for years. Plenty of wonderful things to choose from here! While the entire selection is not here yet, Shylah Honey is working at bringing over the other styles and has posted information on how you can request your favorite styles from SL to be brought over. Keen-eyed Leanna Caerndow was quick to point out that they forgot to remove the "AVN" from the signage. Oopsie! Upon landing at the main store on Damselfly Hair Salon sim, turn around and you can see that construction is underway for the "Dragonfly Skins for Life" shop. Hurry on over to Dragonfly Hair Salon to see what's new. And guys, don't feel left out! There are a few great styles for men as well, though most are the longer variety, there are a few short styles to choose from. They are all mixed in with the ladies hair though, so you have to explore a bit. Everyday Lashes by B[u]y Me! avination!!!!! Throws tomatos at sign post!!!! We don't need Damselfly we need Boudicafly hair. I didn't buy anything even though they had 2 or 3 styles that were pretty close to my hair style (if you can call it a style at all, that is) in RL. I'll do my best to make some Boudiful things for you all! And we all know Ophelia Rose has some lovely things in the works with Wish hair! I keep popping over to her store on Harvest Moon and things are getting moved around and prettified. Exciting!